This post is part two of a two-part essay on equitable growth in Latin America. For part one, click here. The combined piece has been featured by the Washington Center for Equitable Growth. Every country with available data in the region has grown by more than a 2.4% annual rate over the last decade with the exception of El Salvador. But there are no countries that meet Fajnzylber’s standard for relative equality left in Latin America. Indeed, to re-run his numbers is to confront a world changed by inequality, for there are few countries in the world left that meet the standard he established twenty-five years ago. His developed world average had been a ratio of 0.8; now the world’s best performers on that metric are the Scandinavian countries and a few places in Eastern Europe, hovering around 0.6. Canada and France today barely meet his lowered-expectations standard for Latin America in 1990, at 0.4. The United States has a ratio of 0.23, and the Latin American countries are terrible performers: Uruguay and Nicaragua are the only countries over 0.2; Mexico’s ratio is 0.184, Argentina’s is 0.156, Venezuela’s is 0.152, Chile’s is 0.140 and many are below 0.1, including Brazil at 0.093, Guatemala at 0.089, and Bolivia at 0.046. Plainly, by using an absolute standard of inequality rather than one that measures the rate of change, this data does not register the progress that some Latin American countries have made in reducing equality over the last decade. To address this, I’ve produced a modified table, using the same growth standard but looking at change in the countries’ Gini indexes over time. Most Latin American countries had a local maximum in their Gini index between 1998 and 2002, and almost all have reached a local minimum in the last year or two. If we take a significant decline in inequality to be a peak to trough reduction in Gini index of 4 points over those ten years, this is the table that results. The story embedded in the data is clear: working from an extremely poor starting point, the experience of most of Latin America has been one of strong and equitable growth over the last decade. The principal reasons that this has been possible are clear enough. Rapid growth in Asia has kept commodity prices high, and Latin America, though now also the producer of many types of sophisticated manufactured goods, remains a major exporter of raw and semi-finished goods. At the same time, most of the region has been ruled by left and center-left governments that have made improving the lives of the poor among their highest priorities. This has taken many forms. Venezuela’s has been the most polarizing: both nationally and internationally, judgments on the effectiveness of the social missions and the economic management of Venezuela’s government allow for little middle ground. In the last decade or so, the poverty rate has been cut in half, from more than 60% of the population to around 30%. But excessive oil dependence, shortages of basic goods, increasing violence, and the recent imposition of price controls suggest that, at best, Venezuela’s economy could have been managed much better than it has been, and, at worst, may be following a classic pattern of populist spending that may be lead to future adjustment that will come at a high cost, both politically and economically. Most of the region, however, has used more conventional macroeconomic management, and, somewhat in the manner that President Obama did with the health care industry, compromised with powerful economic interests in the pursuit of broader goals. Brazil’s ascent, under its charming president Lula da Silva and his successor Dilma Roussef, has been so spectacular that the old joke that “Brazil is the country of the future, and always will be,” no longer seems to hold. But other countries have had even more impressive statistical progress. Ecuador has knocked more than ten points off its Gini index, while Panama has grown at more than 8% annually over the last decade. How then should progress be maintained and extended? There are already some signs of trouble. In Brazil, for example, once-rapid growth has slowed to a trickle; Mexico, frequently championed as one of the world’s great emerging economies, is on the verge of outright recession. And though much of the region has been governed by the left in the last decade, significant redistribution remains rare. There are signature anti-poverty programs, like Oportunidades in Mexico and Bolsa Família in Brazil, that give conditional cash grants in exchange for behaviors like children’s school attendance. But these progressive policies are mixed in with a huge amount of regressive government spending. The budget for Oportunidades in Mexico, for example, is dwarfed by the cost of regressive energy subsidies. Tax collection as a percentage of GDP has increased modestly, but remains meager. 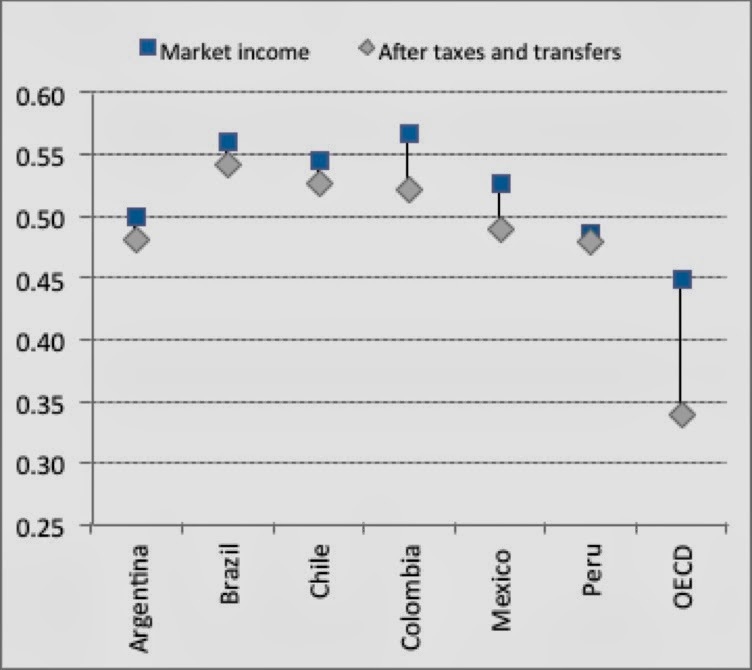 As a result, major Latin American economies do almost nothing to reduce their levels of measured inequality through taxes and transfers. European countries knock 19 points off their Gini indexes through taxation and redistribution; Latin America only 2 points. Pre- and post-tax Gini indexes are virtually identical for the region’s major economies. The hopeful reading of that situation is that there are huge benefits to be gained from relatively straightforward welfare-enhancing programs and the elimination of regressive subsidies, and there is ample room for both growth and the reduction in poverty to follow. The pessimistic reading of the situation is that the last ten years have been among the most propitious in Latin American history for equitable growth, and much more probably should have been delivered. It remains to be seen whether the political systems of societies that remain grossly unequal will be able to make further progress in the decades to come. In a few cases, there is insufficient data to make a clear determination. Guatemala’s most recent year is 2006; Venezuela peaked in 2005 and troughed in 2006 and lacks subsequent data. The CIA Gini index, which is considered less reliable than the World Bank’s, now has Venezuela’s Gini as the lowest of measurable Latin American countries, so it would probably belong in the high growth, significant decline box as well. John Scott Andretta, “¿Quién se beneficia de los subsidies energéticos en México?” in Carlos Elizondo Mayer-Serra and Ana Laura Magaloni Kerpel (eds. ), Uso y abuso de los recursos públicos, Mexico, CIDE, 2012. ← What should the United States learn from the lack of equitable growth in Latin America?